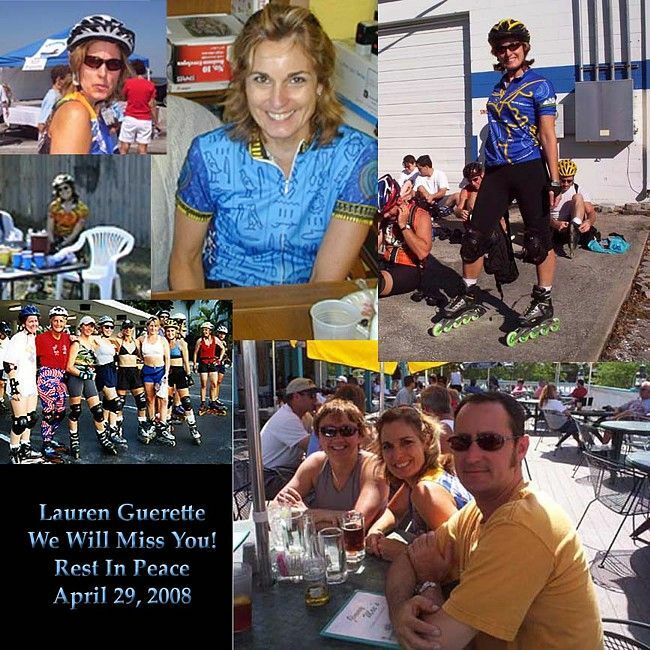 Lauren skated with our area bladers for the past 10-12 years, primarily in Tampa, but she did skate in Pinellas County with the Sunday Bladers. She participated in the Bill Jackson’s Trail Skate, the FriendshipTrail Race and the Great Eskate in Miami, as well as, Tampa Skates and the Thursday Night Skates in St. Pete. Five years ago Lauren married Harvey Minton, they skated together with us and also participated in numerous biking events. On March 2nd, 2008, Lauren woke up with a severe headache; Harvey took her to the hospital where she was diagnosed with an aneurysm a blood clot in the brain. She was operated on immediately, while in recovery Lauren’s family requested, privacy and no visitors, in hopes that her recovery would be peaceful and calm. While in recovery, sadly, Lauren suffered a stroke. At that point, Lauren was transferred to a long term hospital; she was in a coma-like state but with her eyes open. The family was informed that the bleeding was too severe for recovery and she was then transferred to a hospice where she died peacefully, Tuesday, April 29th, with her family by her side. At the families’ request, funeral services will be private. Kyle, Mike M, Charles and Jeanine recently visited Lauren; they experienced some eye movement like she might have recognized them, but no other form of communication. Charles & Karen played music on Saturday and several bladers & bikers gathered to say their goodbyes. Words seem inadequate to express the sadness we feel about Lauren’s passing. She was truly a beautiful person, inside and out, and was loved by all who knew her. We know how difficult this must be for Harvey, her two daughters Marissa and Lexine Anastos, her parents Robert and Judy Guerette of Maine, and Lauren’s entire family, Please keep them in your thoughts and prayers during this difficult time. Memorial donations may be made in Lauren's name to LifePath Hospice, 12973 Telecom Parkway Suite 100, Temple Terrace FL 33637, www.lifepath-hospice.org or The Brain Aneurysm Foundation, www.bafound.org. Thanks to Jeanine and Suzanne for the Photos and the text in this dedication.